A mountain top above the clouds and light-polluted cities of Romania served as a good spot from which astrophotographer Alex Tudorica could watch the 2008 Perseid meteor shower. This composite picture from one of the highest points in Romania, the Omu summit (2,507 meters) in the Southern Carpathian Mountains, captured about 20 of the shower's bright streaks. With the return of the brilliant planet Venus to our evening sky, I'm reminded of an amusing anecdote related by a good friend of mine, George Lovi, a well-known astronomy lecturer and author who passed away in 1993. One night, while running a public night at the Brooklyn College Observatory in New York, the telescope was pointed right at Venus, which was displaying a delicate crescent shape at the time. Yet, one student gazing through the telescope eyepiece stubbornly insisted that he was really looking at the moon. When George pointed out that the moon wasn't even in the sky, the student replied, "So what? Doesn't a telescope show you things you can't see without it?" 1. 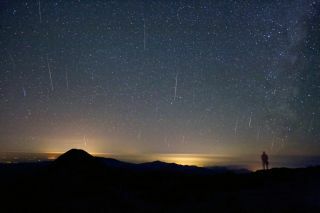 Why don't most meteor showers "shower?" When an announcement is made through the news media about an upcoming meteor shower, it likely will conjure up visions in the minds of many of a sky filled with meteors pouring out of the sky like water from a hose. Unfortunately, in just about all cases, your average meteor shower is a far cry from that. Typically, if you're outside on a clear, dark night you might catch a glimpse of perhaps three to six meteors (popularly called "shooting stars") over the course of an hour's watch. There are rare occasions, when Earth interacts with a dense trail of dust recently shed by a passing comet, and meteors will seem to literally pour from the sky in a shower-like fashion. Unfortunately, such opportunities are few and far between. On May 31, 2022 however, we just might get a chance to witness a true "storm" of meteors, with potential rates of thousands per hour. On that night, Earth might pass through the dusty debris that was shed by a comet that broke apart into several fragments in 1995. 2. Can artificial satellites really be seen with the unaided eye? Most definitely! In fact, many people are surprised that an object orbiting hundreds of miles above our heads can be readily seen without the use of binoculars or a telescope. From the launch of the first satellite, Sputnik, in 1957 to the present, the number of satellites in space has grown at a spectacular rate. There are now over 10,000 satellites orbiting the Earth. British astronomer Desmond King-Hele once noted that a satellite, "looks like a star that has taken leave of its senses and decided to move off to another part of the sky." Satellites are seen at night because they are illuminated by the sun. A satellite entering the Earth's shadow immediately vanishes from view and pursues an unseen path until it again emerges into full sunlight. The International Space Station is by far the brightest manmade object traveling around the planet. Orbiting the Earth at an average altitude of 220 miles (355 km), it can appear to move as fast as a high-flying airliner, taking about two to five minutes to cross the sky. It can easily be confused with aircraft lights, though at its brightest the space station can sometimes appear to rival even Venus in brilliance. 3. Why don't comets appear to zoom across the sky? Before answering this question, think about this: Have you ever seen the moon whiz across your line of sight like a meteor? The answer, of course, is no. Even though the moon is traveling around the Earth at over 2,000 miles (3,200 km) per hour, at its average distance of 239,000 miles (382,000 km) from Earth, its orbital motion is barely perceptible. The moon seems to creep the span of roughly its own width eastward against the star background. Similarly, while a bright naked comet might be moving at many tens of thousands of miles/kilometers per hour through the inner solar system, its overall distance from Earth will likely measure in tens of millions of miles/kilometers. So, while a bright comet will indeed appear to move, because of its distance from Earth, its apparent night-to-night movement against the background stars is very slow. As a result, a comet moves across the sky similar to the way the moon does (or the planets for that matter), instead of like a streaking meteor. 4. Is it hot in July because we're closest to the sun? Thus for the Northern Hemisphere, one would assume that this difference tends to warm the winter and cool the summer. Instead, the large landmasses in the Northern Hemisphere actually work the other way and tend to make the winters colder and summers hotter than those of the Southern Hemisphere. 5. Why isn't the North Star the brightest star? When I was a very young boy, I remember an uncle of mine who took me out on a balmy summer evening, pointed to a brilliant blue-white star directly overhead and said: "See that? That's the North Star" (I later would learn that it was actually Vega, the fifth brightest star in the entire sky). Polaris, the North Star is probably the most important star visible in the northern sky, but many people are under the mistaken impression that it's also the brightest. It actually ranks only 49th in brightness. But, Polaris just also happens to be the closest bright star relative to the north celestial pole. Only the apparent width of about 1.5 full moons separate Polaris from the pivot point directly in the north, around which the stars go daily. Interestingly, because of the wobbling motion of the Earth's axis (called "precession") the celestial pole will draw even closer to Polaris (closest on Mar. 24, 2100 AD). Then, as time wears on, it will gradually draw away from it. In fact, in about 12,000 years, our descendants will have Vega as the North Star. My uncle would have been happy to hear that. 6. So, why is there no South Star? Actually, there is a South Star, but unlike its northern counterpart it is a small, faint star. It is Sigma Octantis, in the very dull southern constellation of Octans, the Octant. It is, in essence, the "Polaris of the Southern Sky" (some texts even refer to it as "Polaris Australis"), although this South Star is only 1/25 as bright as the North Star. Northerners might wonder how those in the Southern Hemisphere find their way around without a bright benchmark near their pole. For that, they can rely on Crux, the Southern Cross, where the longer bar points almost precisely toward the south pole of the sky. 7. Must I wait almost 400 years to see a total eclipse of the sun? Not unless you don't mind doing some traveling. On average, a total solar eclipse is visible about every 18 months somewhere on the Earth's surface. That's an average of two total eclipses every three years. So, the odds are that any one particular spot on the Earth will have to wait a very long time — nearly 400 years (or 375, to be precise) — between total solar eclipses. But, that nearly four-century wait is merely a statistical average. Indeed, the paths of different eclipses will sometimes crisscross over a specific place, so in some cases the wait isn't so long after all. For example: the totality paths of the eclipses of Aug. 21, 2017 and Apr. 8, 2024 will intersect in a zone that that will encompass portions of southeast Missouri, southern Illinois and western Kentucky. So, if you're lucky enough to be living within this region, you'll be able to see two total solar eclipses over a time span of just under seven years! Cities within this zone include Marion and Anna, Ill., Cape Girardeau, Mo., and Paducah, Ky.
On the opposite extreme, we can cite the case of the islands of Bermuda. Their last total eclipse was on August 30, 1532 with the next one scheduled for February 16, 2352! 8. Why doesn't the vernal equinox occur on March 21 anymore? It doesn't seem right, does it? I mean, when most of us were growing up, the first day of spring, also known as the vernal equinox (in the Northern Hemisphere), was on March 21, not March 20. Right? Now, all of a sudden spring is arriving on March 20. How did that happen? There are several factors to account for the date shift, including variations in our Gregorian calendar; the precession or "wobble" of the Earth's axis and the pull of gravity from the other planets, which, ever so slightly, affects the location of the Earth in its orbit. Interestingly, in the Northern Hemisphere, spring is currently being reduced by approximately one minute per year and winter by about one-half minute per year. Summer is gaining the minute lost from spring, and autumn is gaining the 30 seconds lost from winter. Winter is the shortest astronomical season, and with its seasonal duration continuing to decrease, it is expected to attain its minimum value of 88.71 days by about the year 3500. 9. Is a half moon half as bright as a full moon? It is certainly logical to expect that when the moon is 50 percent illuminated (at its First or Last Quarter phase; also sometimes called the "half-moon"), that it would be shining only half as bright as a full moon. Indeed, if the moon's disk was flat like a white piece of paper or a projection screen, then its surface brightness would be the same all over and this would be true. But, of course, this is not the case. In contrast, at full moon, the sun is shining straight down virtually everywhere on the lunar surface (except near its edges) so that there are no shadows at all. Believe it or not, it only takes about 2.4 days from the full moon for it to shine half as bright. When the moon is at First Quarter phase, it is actually only nine percent as bright as full! At the moon's Last Quarter it's even dimmer — eight percent — because of the greater visible area of the dark maria (or lunar "seas") on its illuminated portion. 10. Can you see through clouds with a telescope? In December 1973, a special gathering was organized in lower Manhattan at dawn to observe the newly discovered Comet Kohoutek. Prospective viewers were invited to view the comet through a variety of telescopes, followed by a chowder breakfast. On the appointed morning, the sky was hopelessly overcast, yet thousands of people came just the same, many still expecting to get their promised view of the comet, despite the clouds, through the assemblage of telescopes. After an astronomer explained from a sound truck that the comet would not be visible he asked if there were any questions. From out of the crowd somebody asked, "So what do we do now?" The astronomer simply replied: "Have another bowl of chowder!" Unfortunately, a solid deck of low, gray clouds completely obscured any possible view of the sun (some attributed the bad luck to the fact that it was also Friday, the 13th)! One reporter from a local news radio station arrived just moments before the predicted peak of the eclipse. He pushed his way through the group and, somewhat out of breath, asked which telescope he could look through to view the eclipse. When it was explained to him that the eclipse couldn't be seen because of the clouds, he was incredulous, saying in exasperated tones, "You mean I came all the way up here for nothing?" But in the end he had the last laugh. Composing himself, he quickly filed his report from a nearby phone booth: "The clouds eclipsed today's eclipse, and this reporter was rather surprised to discover that not even these impressive telescopes could provide us with a glimpse. If you ask me, this is the biggest cover-up since Watergate!"